Recorder players always struggle with lack of repertoire. The number of sonatas specifically written for the recorder is limited, and therefore they often end up playing sonatas composed for any kind of treble instrument. They also arrange sonatas which were conceived for other instruments, like the transverse flute or the violin. The repertoire of solo concertos is even more limited. It is an interesting question why this is the case. There seem to be two reasons. Firstly, the recorder was particularly popular among amateurs, and therefore it is only logical that the main repertoire for the recorder consists of sonatas rather than solo concertos. Moreover, in the 18th century there were no professional recorder players. Recorder parts were usually performed by musicians whose main instruments were the transverse flute or the oboe. Secondly, at the time the form of the solo concerto became in vogue, the recorder was on its way out. From the 1720s onward it was gradually replaced by the transverse flute. "Apart from the compositions of G.Ph. Telemann, the six pieces brought together on this compact disc - at least according to the current state of research - represent practically the entire repertoire of recorder concertos from the realm of German style", Michael Schneider and Steffen Voss write in the programme notes. That very fact makes this disc an important release. That is even more so as the programme contains no fewer than three compositions which have been recorded here for the first time. It begins with the remarkable Concerto in F by Johann Friedrich Fasch found in a manuscript in the New York Public Library. 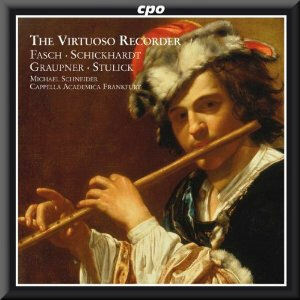 The fact that the recorder was not the first instrument of professional musicians in the 18th century explains that recorder parts are usually not technically very complicated, but according to Michael Schneider this concerto by Fasch is an exception. This suggests it was written for a highly-skilled recorder player. It follows the Vivaldian pattern of three movements: fast-slow-fast. Schneider sees a parallel between the largo and the aria 'Aus Liebe' in Bach's St Matthew Passion: the recorder is accompanied only by the strings playing staccato chords, and there is even a fermate as in Bach's aria. The Concerto in g minor by Schickhardt is remarkable as well. It has six movements, and they differ in scoring. The first and the two last movements are for the whole ensemble, whereas the second movement is for recorder, violin, two oboes and bc. In the third and fourth movements the scoring is reduced to recorder and basso continuo. The first and fifth movements contain some episodes for violin solo. The difference in scoring gives the impression of this concerto being a musical patchwork. An even more striking example of patchwork is the Concerto in F by Graupner. That’s a feature of Graupner's instrumental oeuvre in general. It has little in common with what was written in his time. Many of Graupner's concertos and orchestral overtures seem to be sequences of the composer's flashes of inspiration during the compositional process. That makes it hard to get a grip on his music. At the same time it makes it all the more intriguing and captivating, and this concerto is no exception. The last item on the programme is by Mattheus Nikolaus Stulick, about whom hardly anything is known. He was from Bohemia and worked as a trumpet player at several courts in Germany. His Concerto in C has solo parts for recorder and bassoon, but the first movement also contains a remarkable episode for violin solo. This concerto is strongly reminiscent of the concerti da camera by Vivaldi. The same is true of the Concerto in B flat by Johann Adolf Scheibe, who is mainly known as a theorist. In this capacity he was very critical of Johann Sebastian Bach's style of composing. This concerto reflects the galant style he preferred. The fast movement includes short cadenzas, whereas the slow movement impresses because of its beautifully swaying rhythm. Lastly, Johann Christian Schultze: the Concerto in G is often attributed to Johann Christoph Schultze (c.1733-1813), and that would make this piece the latest solo concerto for recorder of the 18th century. The attribution to Johann Christoph Schultze is not that inconceivable, considering the theatrical character of the middle movement and the fact that this Schultze was a composer of music for the theatre. But Michael Schneider and Steffen Voss believe that this attribution is historically untenable, and that Johann Christian Schultze is the real composer. He was an oboist in the Prussian army and later violinist in the court chapel in Berlin. The dramatic character of the middle movement comes off well in the performance of Michael Schneider and the Cappella Academica Frankfurt. The other compositions on this disc are played equally well, with a lively interaction between the soloists in the various pieces and the tutti. The rhythms are well exposed and the tempi are convincing. Only now and then could I have imagined a more extraverted approach. But the combination of repertoire and performance makes this disc a winner. For recorder aficionados it is indispensable. The programme notes in the booklet are in German, English and French, and the source of every piece is given in the tracklist. I have never seen a CPO booklet without errors so I am not surprised that the list of players mentions just one oboist, whereas the Schickhardt concerto contains two oboe parts.